Just wondering on the cost of this print. How would I get print? Your paintings / prints are beautiful one nicer then the other. I love the one all dogs go to heaven , I belong to a Bernese mountain dog club on face book and one of the members saw your work on a cruise ship and and posted it just beautiful . Can you send me information on how I can purchase it. Are they numbered? 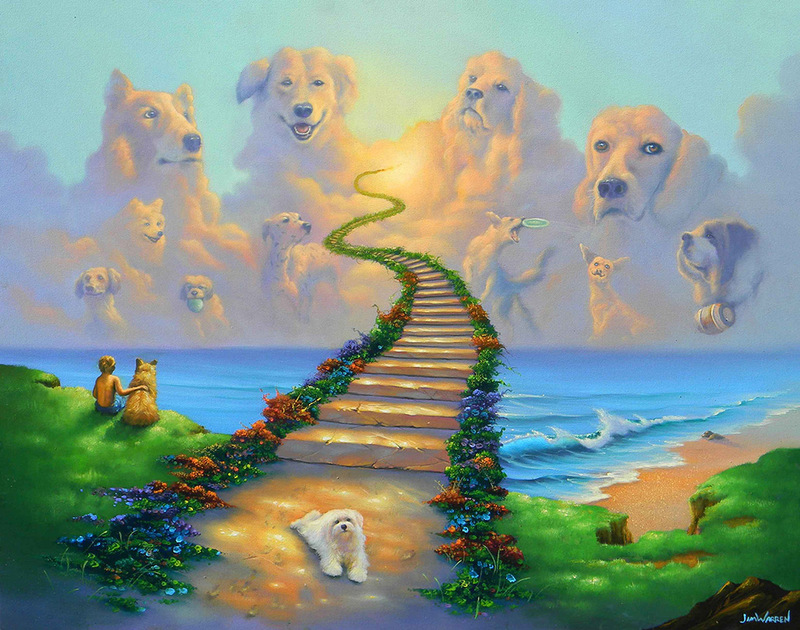 Want to buy the All Dogs Go To Heaven 3. How do I purchase? Your work is beautiful. one, most special fur child ever, is dying of brain cancer. A few years ago when she was initially diagnosed, she went through 20 plus arduous radiation treatments. And then was pronounced cancer-free. Unfortunately it has come back and there is nothing to do but wait for her to tell us she’s ready to go. She is a wolf although we say she is a shepherd/husky. Her name is Faith. When she goes to Rainbow Bridge Faith will be reunited with all her former pack mates. How much more would it cost to have you paint Faith at the beginning of the journey, instead of the dog you painted? I probably won’t be able to afford it but I thought I’d ask. Faith came to us on my husband’s 60th. Birthday. He will be 71 soon; I can’t think of any present in the world that would mean as much as your beautiful painting with our Faith in it. Beautiful work!! What is the cost and where would I be able to purchase ? This is great material. Among the best subject material I’ve come across at this time. Continue the great work. You can scarcely come across posts such as this anymore. I recall when you could find one or two topics like this in minutes however now it’s much more difficult. I nearly failed to check this website out nonetheless I’m just glad I have. It’s actually very good compared to many others I’ve found. I will certainly come back.